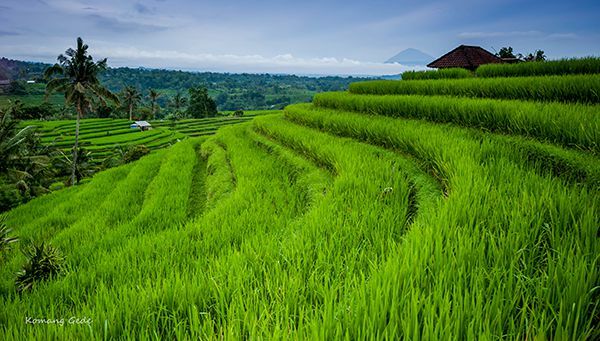 Jatiluwih village in Penebel District, north of Tabanan, has paddy fields following the contours of terraced land against the background of spellbinding Mount Batukaru and Mount Agung use traditional Balinese irrigation known as SUBAK, Bali's community-based water control management system. Lies at an altitude of 700 meters, the cool atmosphere of more original beautiful Jatiluwih is better than the most well known Tegallalang which has plenty of cafes and souvenir shops. Denpasar > Mengwi > Baturiti > Jatiluwih. Jatiluwih has gain acknowledgement from UNESCO as part of the world's cultural heritage. To preserve the largest area of 53,000 hectares agriculture fields on the island, Tabanan Regency Administration would not allow the development of star-rated and city hotels anymore, unless tourism facilities with a commitment to environmental conservation would be allowed with 30 percent of buildings and 70 percent had to be left naturally as paddy field or plantation. The administration has also decided 300-hectare protected paddy field zone with a 100-hectare housing zone lies outside the protected zone. I really like this place in the morning its so awesome.